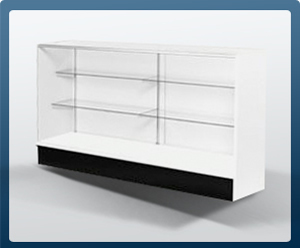 At Discount Showcases, we take pride in bringing you high quality display cases and other retail display products for sale at wholesale prices. Our selection includes a variety of glass display cabinets, trophy cases, countertop showcases, and retail jewelry display cases that are perfect for a wide array of merchandise such as accessories, gems, jewels, valuables, collectibles, and sports memorabilia. In addition to extending wholesale prices to our customers, we also provide fast shipping and exceptional service which is unmatched in our industry. 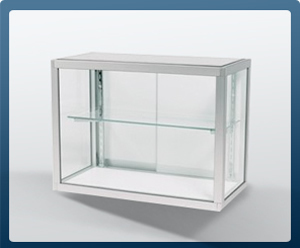 Our display case accessories are for every budget w/ Fast Flat Rate Shipping Nationwide! All glass showcases can be pre-made and shipped or a shipment of quick and efficient diy (do-it-yourself) assembly kit. We would like to begin a partnership with your business by supplying you with a powerful selection of wholesale glass wall display cases, including wood display cabinets, trophy cases, and jewelry showcases available at wholesale discounts that are much superior to used display cases on the market. Not all jewelry showcases are created equally. 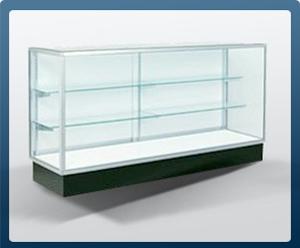 Our retail store display cases offer both style and durability which are second to none. Constructed with attractive designs and made with the best materials available, glass display cases from Discount Showcases can make a big impact on your retail efforts. 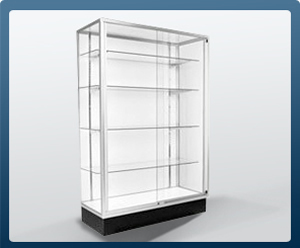 Whether you need a glass display cabinet for a jewelry store, a trophy case to boast your collectibles, or a wood showcase to display your merchandise, we are sure to carry a display case to match your goal and aspiration. Presentation plays an important role in selling your retail merchandise. Whether you are placing jewelry for sale or other goods, unique display cases can make a measurable difference in the way you do business. Our display cabinets create a wonderful shopping aura and add character to your product lines, making them more desirable to customers and inevitably irresistable. Discount Showcases takes gratification in providing our clients with the very best in wood and glass display cases, trophy case cabinets, display accessories, and retail showcases. Call or place your order online with us today and enhance the way you sell today!